Learn who's playing in the 2019 Super Bowl, what time the game starts, how to watch, how to stream and more. The 2019 Super Bowl is right around the corner. Come Sunday, people will be crammed into living rooms and sports bars all over the country to cheer on their team or just to enjoy the commercials, halftime show and party food. Regardless of why you're watching, we have all the information for you so that you won't miss a second of the action! 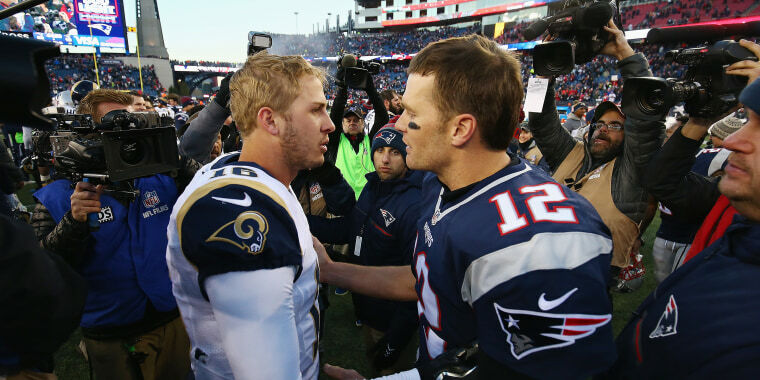 The New England Patriots (11-5) will face off against the Los Angeles Rams (13-3). The game is a rematch of Super Bowl XXXVI in 2002, when the Patriots defeated the then-St. Louis Rams, 20-17. The Patriots will be striving for their sixth title while the Rams are aiming for their second since 2000. Super Bowl LIII will be played in Mercedes-Benz Stadium in Atlanta, George, home to the Falcons during the regular season. It will be the first Super Bowl hosted at the stadium since it was built in 2017. The Super Bowl kickoff time is scheduled for 6:30 p.m. ET on Sunday, February 3, 2019. Pregame shows will begin airing at 11:30 a.m. ET and continue throughout the day up until kickoff. Super Bowl LIII will air on CBS with Jim Nantz and Tony Romo calling the game. Nantz will be broadcasting his fifth Super Bowl while this will be Romo's first. If you're unable to watch the game on television, the CBS Sports mobile app and CBSSports.com will be streaming the game for free. The Super Bowl typically lasts for four hours. The game itself runs for around three and a half hours, including commercials, and the halftime show is typically 30 mins. Who is performing in the Super Bowl halftime show? Maroon 5 will headline the halftime show with rappers Travis Scott and Big Boi joining them during the performance. Maroon 5 has released six studio albums since 2002 with their latest, Red Pill Blues, dropping in November 2017.